No, the kitchen still isn’t done. 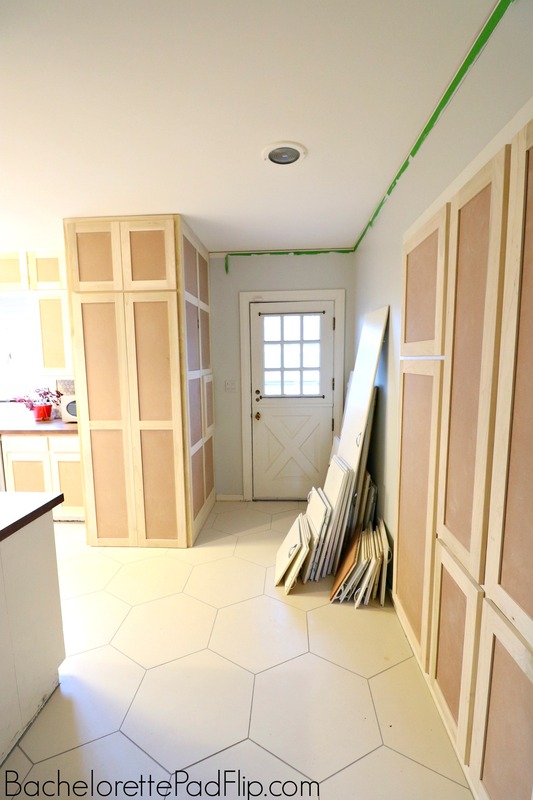 From hiccups, delays, and other houses, the kitchen at Flip 5 is almost done…but not quite. The flooring was quite the debacle, but I’m happy to say it’s finished. I’ve painted the walls. And, since my last update, the cabinets have got a partial face lift. 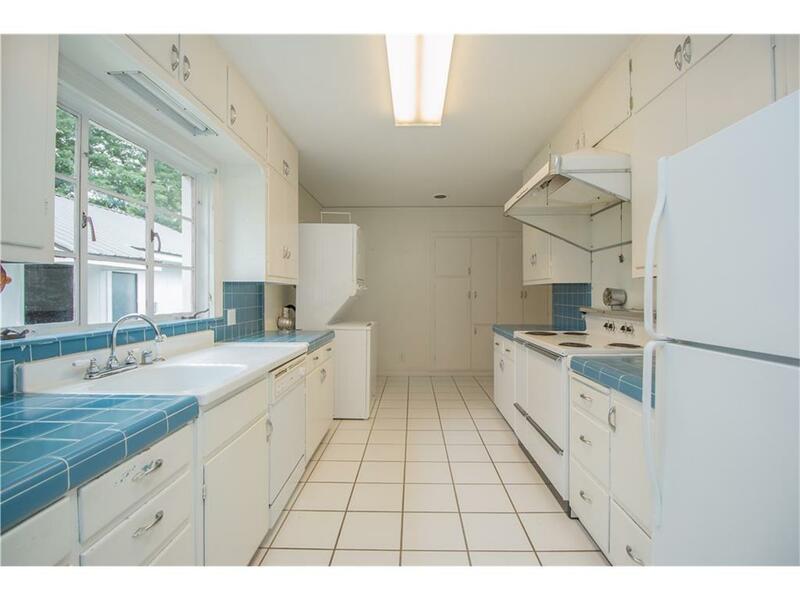 The original kitchen was a lot of white…almost too stark. And that blue tile countertop was not in good condition. The faux wood butcher block counters have warmed up the space, and even though I didn’t appreciate the white cabinets, I did appreciate the cabinets. The cabinets themselves were in good shape, so I kept them and had new doors made. I chose a shaker style and will keep the original midcentury pulls. 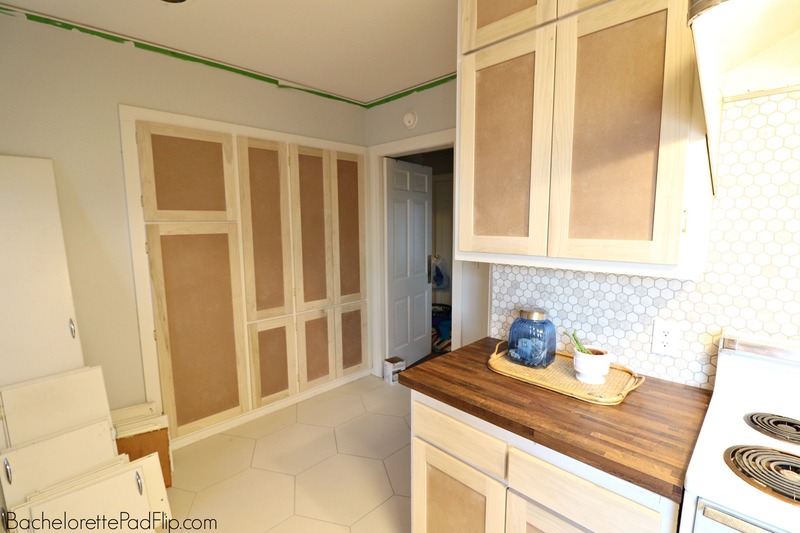 At this point, the cabinets have not been painted and the pulls have not been added either. I swapped the original visible hinges with recessed hinges. Swapping out hinges isn’t as easy as just ordering new hinges and they work. My cabinet guy made sure he ordered ones that would work with the doors he made. The original hinges did leave holes in the cabinets that will need to be filled. 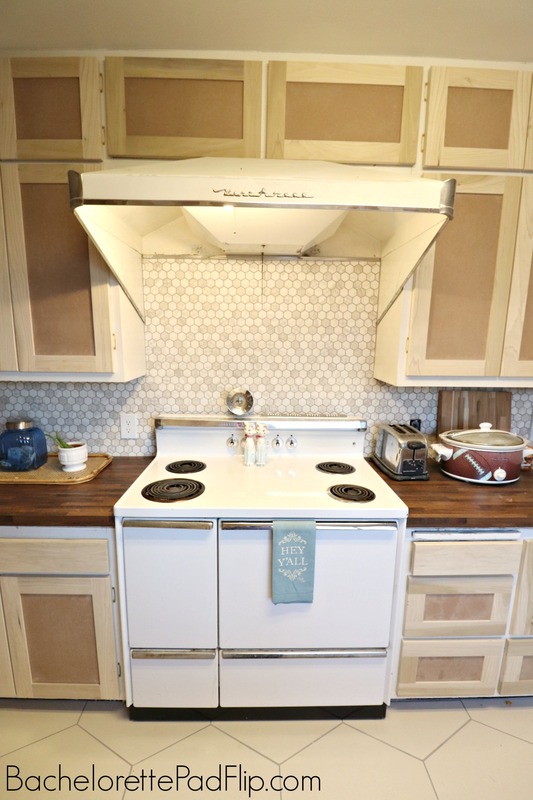 One of the features I loved about the original kitchen is the stove/vent hood, so of course, I had no plans to ditch those! I did ditch the metal “backsplash” behind the stove. 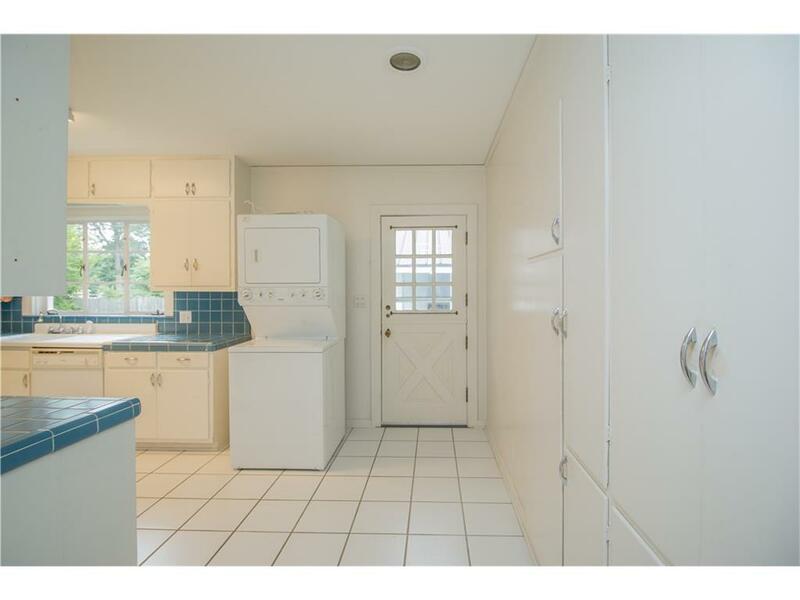 I know a white kitchen is popular, but there was so much white. I wanted the new backsplash to be showcased on the wall in that space rather than a sheet of metal. Currently, the fridge is still in the kitchen. I’m limited in the refrigerators I can have because of the size of the space, but I will swap it out for a stainless one at some point. In the new kitchen design, the white vent hood and stove (both of which are quite large) and the creamy tile will be the light spots of the kitchen. I’ll be warming up the colors with navy cabinets and of course the wood tone on the counters. My biggest debate at this point, and one of the many reasons I haven’t pulled the trigger on paint yet, is whether I should have the cabinets be all navy or have bottoms be navy and uppers white. On this side of the kitchen, that would work easily. On the other side, however, there is not a defined place to divide the colors. One of the biggest debates I had in this kitchen was the laundry room space. After meeting with plumbers and electricians, it was going to be extremely expensive to move the laundry into the studio apartment. And I wasn’t totally confident it would add value to move the laundry out of the main house. So, I was left with leaving the laundry in the kitchen. But I knew I certainly didn’t want a visible washer/dryer, so my cabinet guy got to work. We designed a laundry closet that’s big enough for the unit and storage above. We tried to design it to look like a pantry. It wasn’t in the original kitchen, but I think it was a necessary addition. It’s not my ideal laundry space, but I was very, very limited with my options. I think for what I had to work with, this laundry closet disguises and functions…the two objectives I had. It was also a really affordable alternative to moving the laundry out of the main house. This closet costs me around $350 with parts and install. In addition to the cabinets, I wanted the pantry doors to match, so I had new doors made to match. If you recall, I debated about moving the laundry to the pantry area, but the space just wasn’t big enough. And I’ll be honest, I’m kinda glad because that pantry is great additional storage! It houses food, dishes, trash can, and the built-in ironing board. In a smaller house, making the most of storage is essential. It’s the same space, but it has changed so much. I love the design of the beehive tile. I love the recessed hinges. And I can’t wait to get the doors painted and hardware added. I’m obviously still in the midst of painting! 😉 Since building the cabinet, I have some touch-up painting to do, but then the walls will be done! Thank God– I hate painting! I kept the original doors because who knows when I can use them again. I’m sure Uncle Nuny and I came come up with something for them! The kitchen isn’t open-concept. It’s a galley kitchen. For a lot of buyers, especially millennials, that’s a con. It was going to be monumentally expensive to make it open concept, and I had no desire. The wall is load bearing, and unlike Flip 3, it was going to take so much work to make it happen. Nope. I had no desire for that. So I kept the galley style. So my only option to appeal to millennials is to amp up the design, so I’ve spent up– on the floors and backsplash especially. Like I already mentioned, my biggest current debate is about two tone cabinets. I know that the bottom cabinets will definitely be navy because I think there needs to be some contrast against the cream floors. And if it wasn’t for the new laundry closet, I’d pull the trigger on white upper cabinets. But here’s where I’m conflicted: on this side of the kitchen, if the uppers are white, the bottom is blue, what color do I paint the closet? I’ll be painting the pantry white, but the laundry closet will but up to both white cabinets and navy cabinets, so I can’t decide! I’ve also debated painting the uppers blue too and that way it isn’t an issue. 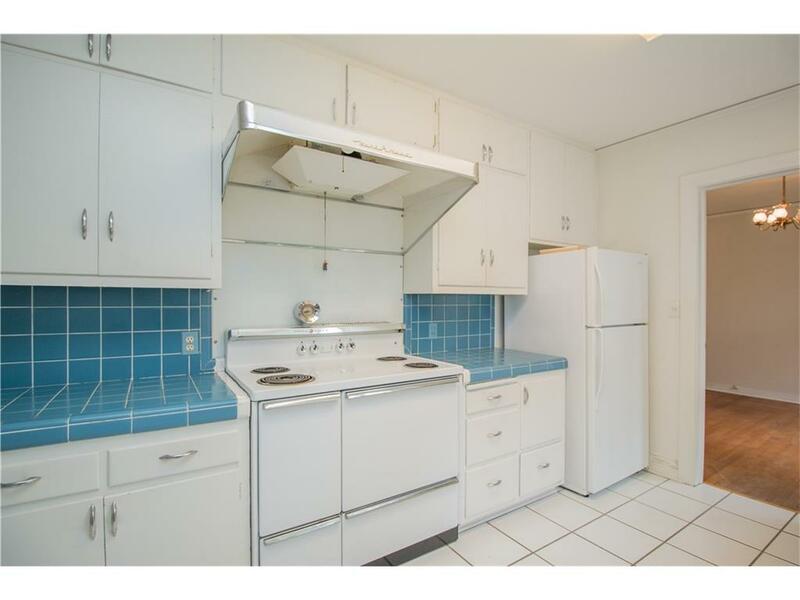 Then I get nervous that for a galley kitchen that is awfully bold and dark. 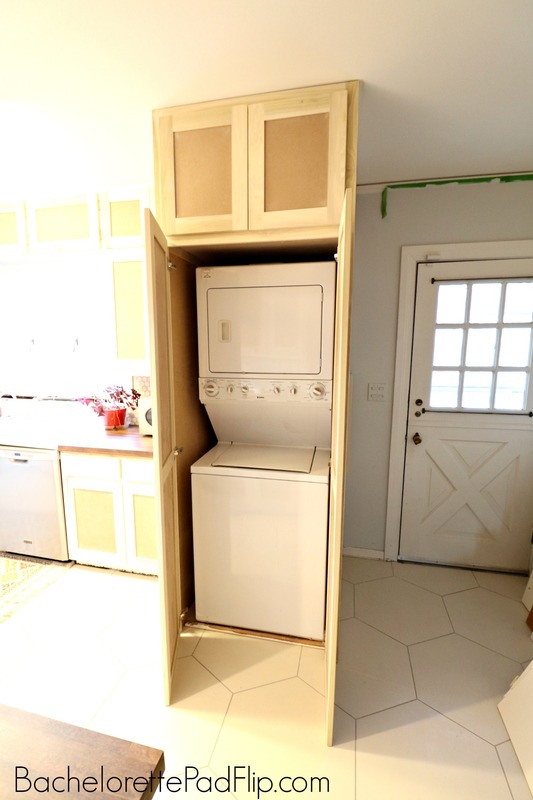 So here we are…unpainted cabinets because I can’t decide! 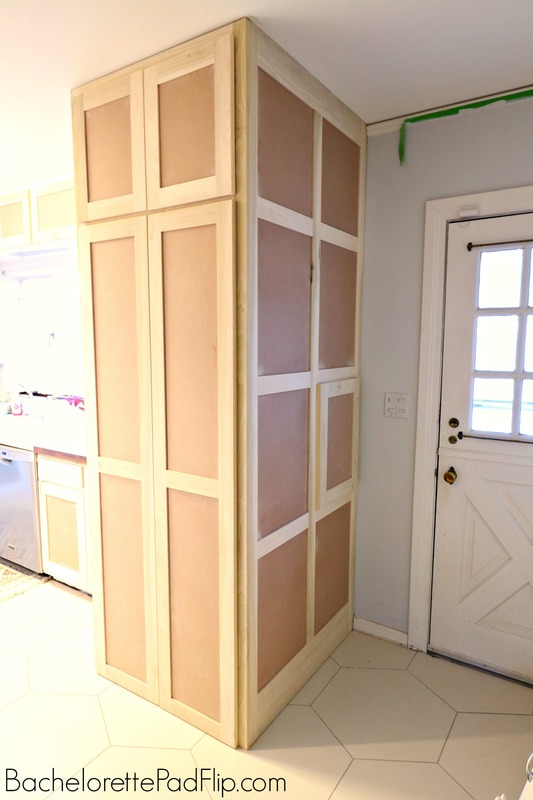 The final change I’ve made recently was removing the door between the kitchen and dining room. It was such an antiquated design, so I took it off. It’s an awesome, heavy vintage door with great brass hardware, so I’ll hang on to it. I might even use it as a barn door somehow in the studio. I wanted the space between the kitchen and dining to be open. I think that’s more conducive to entertaining. Now that Flip 6 is done, I’m refocusing on Flip 5. I’ve been so focused on getting Flip 6 done that Flip 5 took the back burner. I live in Flip 5, so I can afford to delay some of the work. But, on the other side of the token, I live in Flip 5…so I want it to get done! Ha. But, by this point, I’m more than used to living in construction zones. As far as construction zones go, this one isn’t that bad. At least the kitchen is functional! 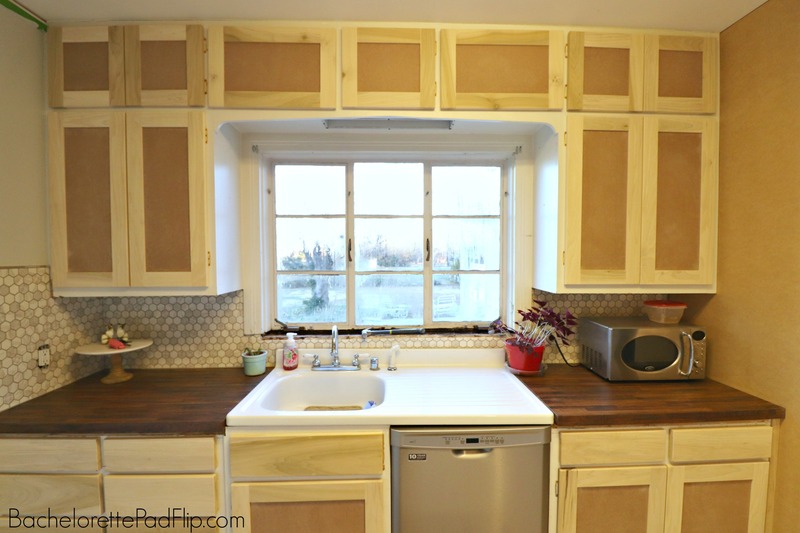 I’d love to hear your thoughts on the cabinet paint color! And stay tuned as this room wraps up! Let’s recap–You have a white stove, Stainless steel dishwasher, and going to buy a S/S refrigerator (& white washer/dryer combo) & a white sink. And you want to add Navy and White cabinets. Maybe a slate grey to match the S/S appliances with a pop of navy somewhere. Why not paint the w/d cabinet white and paint the trim navy or paint it navy and paint trim white. I think you have made some great decisions and you have such good taste that whatever you decide on in the kitchen will look beautiful. I can’t wait to see it finished and all shined up. I love what you have done. I personally, would go with navy lower cabinets, white uppers and paint the laundry cabinet navy. Looking forward to seeing what you choose. I am sure it will look great. I’m liking the use of blue to contrast with that stunning tile (both floor and backsplash). However, a true navy blue will be dramatic but it may indeed be too dark. Have you given thought to going a shade or two lighter – using a more grey based blue? 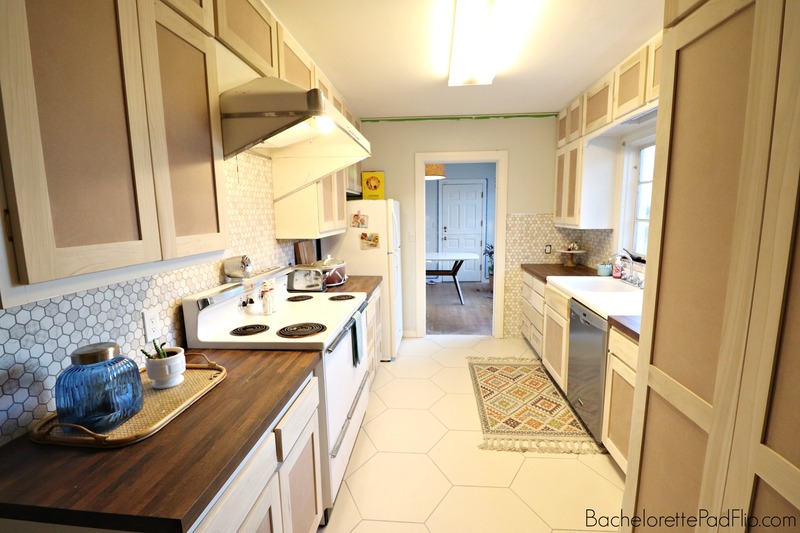 And I believe I’d use the same shade on both top and bottom in the galley area with all white trim, which would accent the white sink and stove and yet allow the SS fridge and dishwasher to blend almost seamlessly into the painted cabinets. I’d also paint the back door the same blue and keep the white trim everywhere. I recently saw a matte white subway style tile at Home Depot which might work for the window sill area, as the matte finish wouldn’t detract from the backsplash. Choosing paint is not for the faint of heart! Get a couple of samples and test them out. Good luck! Your kitchen is looking great! Love the laundry closet, too. If it was my kitchen, I would change the dishwasher to white (save the SS one for Flip #7) and keep the frig white, too. IMVHO, the 2 new SS appliances will mess up the great vintage vibe you’ve got going. Find a medium dark gray that coordinates with the gray tones in the backsplash (could even be a blue gray if that’s the tone) and paint all cabinets that color. If you still want some blue, use it as your accent color in accessories, artwork, towels, dishes, cookware, etc. Please keep us updated. I agree with all of Becky’s comments. I have a galley kitchen very much like what’s in your house. My cabinets are all painted cream (matching all of the trim in the rest of the house, otherwise I’d have painted them white). All appliances are white. I agree that throwing a stainless appliance amongst the white ones would be jarring. Also, it will break up the space,which is already visually small because of the galley design. Make the appliances as seamless as possible, IMHO. Also not wild about navy. I’ve had my cabinets both light and dark (have refinished them 5 times in the 30 years I’ve been in the house!). The darker color really closed in the kitchen terribly–I’d be inclined to stay on the light side. Navy and white, but maybe stain the sink side of laundry closet to match counter tops and then the other two sides white? I really like the changes you made, especially, that you kept the vintage stove. I think that if you’re going to be true to that era dark navy might be too dark have you considered doing all the uppers and the washer and dryer white and perhaps using a neutral gray on those lowers and then bringing in navy blue as your accent color somewhere. I love the beehive floor, too! And the closet for w/d is awesome! the stainless. If you’re preserving the retro feel, white may work better than stainless, but maybe you’re going for industrial Vibe. BM has Colorado Gray; bluish in some light. I DO like base cabinets darker & uppers white; & white for laundry. Regarding the window sill, I vote for a piece of marble that has a bluish grey vein running in it, to tie in with the backsplash tiles and bring that warm vintage vibe into the kitchen. Good luck! I love the washer/dryer closet. Looks great. Echoing others comments, the lower cabinets are interrupted by several different finishes/colors. Maybe you can use your Navy color idea in another space. Here, I think, it needs to be a more neutral colorway that can tie in with all your appliances and tile and not look too busy since the tiles have the stage. Under your window, a great chance to insert a Navy color pop of tile. I think the highlight of your space is your tile and flooring. I would let them be the stars and keep all the cabinets neutral, a light silver gray would look wonderful. If you must have Navy, add it in accessories as pops of color here and there. If you can get your hands on some computer imagery to try out your color ideas, it might help you decide. The ideas presented above are good ones. Navy is such a strong color. I like the idea of a blue grey for the cabinet color and using the Navy for accents. Let that floor and backsplash shine! And a nice hefty marble piece for your window stool. Your laundry cabinet is wonderful. You have done a fabulous job. Looking forward to seeing what you decide. Carry on ……. I love the idea of navy blue bottom cabinets! It sounds crazy but why not painting the laundry cabinet both colors- white on the sides and the doors navy blue or…. White doors and black chalk paint on the sides. I don’t think the navy blue is gonna darken the kitchen as long as the upper cabinets stay white. The floor and backsplash are bright. Love the countertop. Love the floor! It’s save to keep all white cabinets nowadays so why don’t you try priming all the cabinets first and see how you feel about them being all white although as I said I love navy blue! Chalk paint the side of the laundry cabinet that sits against the cabinets and counters. It becomes usable space, and doesn’t make that area seem like an afterthought. Paint the rest of the laundry cabinet white so it blends with the pantry that is on that side of the room. Another option is to paint the laundry cabinet the same color of the walls so it “disappears”, and doesn’t take away from the main focus of the room. 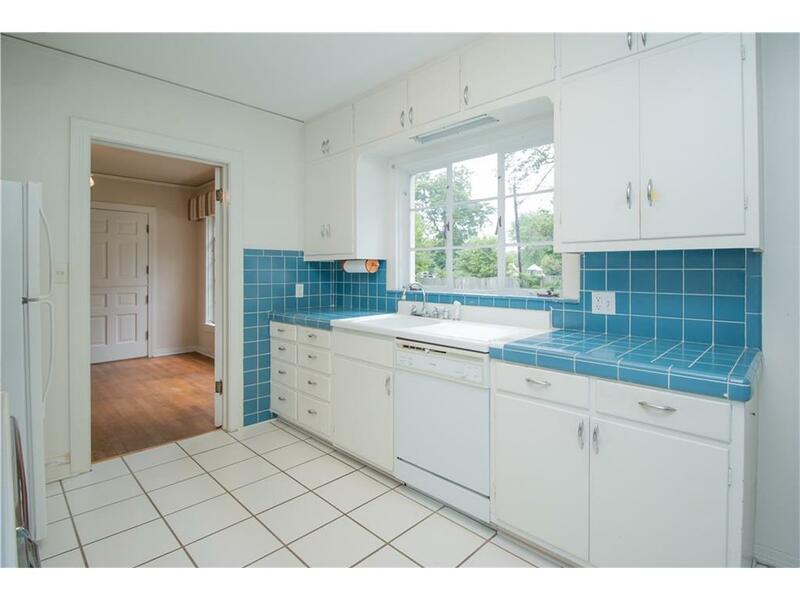 I’m of the opinion that navy cabinets and/or doors would be too starkly contrasting with the lighter tones of the tile already in the kitchen. I like the suggestion of a slate/grey/muted blue-grey cabinet and/or door color. Use that to bring in the vintage sense of the room. Grey is a really popular mid-century color. The recommendation of accent pieces, such as towels and serveware that would give a pop of navy sounds great to me! You do have great taste, and a flair for design, so I’m sure you will choose well and the kitchen finishes will be beautiful! Can’t wait to see what you decide! Would a medium blue on both upper and lower cabinets work? Maybe something like Sherwin Williams 7608 “Adrift”? 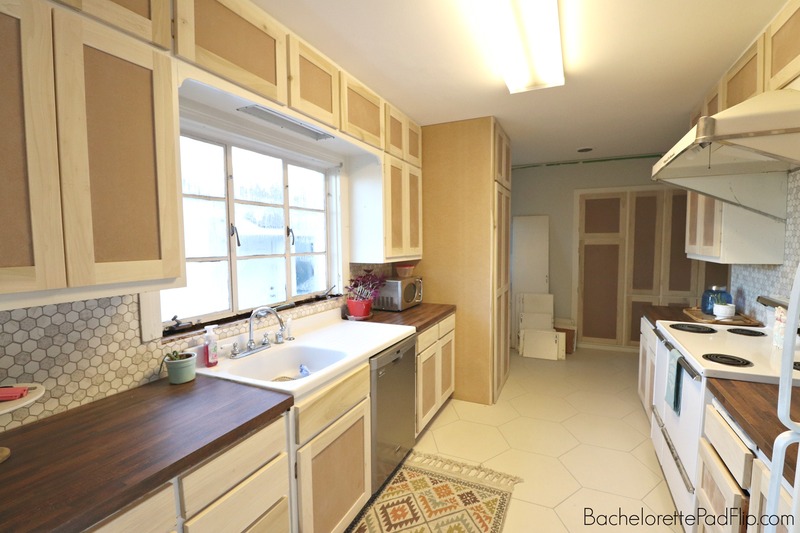 Also, I’m very interested in what method you use to paint the cabinets. I’ve painted mine twice in the 17 years we have lived here, and I really want to change the color again, but it is SUCH a big job. There’s got to be an easier way. Anyway, I love the floor and wall tiles, and can’t wait to see what you decide on the cabinets. Maybe adding trim around the perimeter of the W/D cabinet and a piece horizontally in the middle of the cabinet wall toward the sink to match the height of the front cross trim that is about counter height. This side trim could be a bit wider if necessary for the color scheme, It feels maybe that would add the same design “format” to the W/D cabinet as the other cabinets and allow the upper and lower colors of your choice to be more integral to the rest of the kitchen cabinets? And I know this sounds funny, but when I had lower darker cabinets it was much more of a chore to keep them looking and being clean than when I have had lighter cabinets near the floor. Appearance is a lot yet convenience counts too for those of us having owned various homes for 50 years.